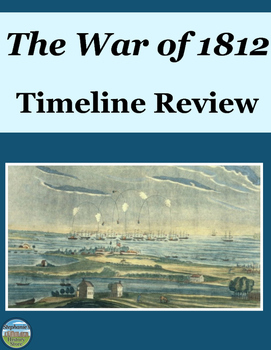 Students review the War of 1812 by completing a timeline activity and answering 4 questions. There are 24 items for students to place on the timeline. Students must classify each item according to a system detailed in the instructions, they have one task to complete for 7 items of their choice, and another task to complete for 4 other items of their choice. 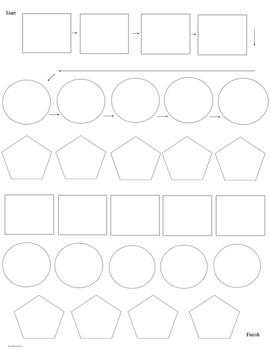 All instructions are provided in the handout. There are arrows in the first two lines of the timeline showing students the direction to fill out the pieces in and extra pieces for students to add additional events. This could work for a sub! Answers are provided where appropriate. 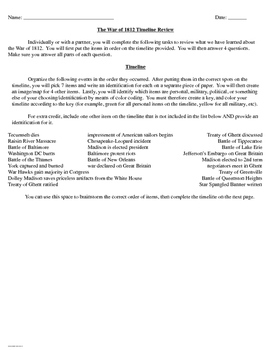 --Explain the significance of The Star Spangled Banner in a solid academic paragraph. Why do you think this became our National Anthem? 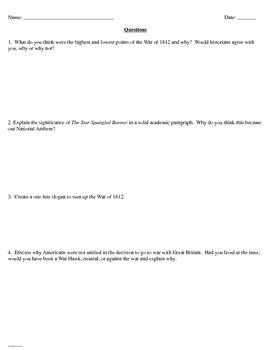 --Discuss why Americans were not unified in the decision to go to war with Great Britain. Had you lived at the time, would you have been a War Hawk, neutral, or against the war and explain why? Consider the bundle to save!